Madhuca indica J. F. Gmel, Madhuca latifolia (Roxb.) J. F. Macbr, Illipe latifolia (Roxb.) F. Muell., Bassia longifolia L., Bassia latifolia Roxb. Mahua is sometimes substituted for Diploknema butyracea (Roxb.) H. J. Lam, a related species with similar properties that was formerly known as Madhuca butyracea (Roxb.) J. F. Macbr. Mahua (Madhuca longifolia (L.) J. F. Macbr.) is a multipurpose tropical tree mainly cultivated or harvested in the wild in Southern Asia for its edible flowers and oil seeds (CJP, 2007; Fern, 2014; Orwa et al., 2009). Mahua is a medium-sized deciduous tree, which grows to a height of 16-20 m. It has a short, stout trunk, 80 cm in diameter. The crown is rounded with multiple branches. The bark is grey, vertically cracked and wrinkled, exfoliating in thin scales. The leaves are alternate and clustered at the end of branchlets. The leaf blade is simple, 10-25 cm long x 6-12 cm broad, oblong-shaped, rigid, thick and firm, woolly at the lower face and exuding a milky sap when broken. Young leaves are pinkish or reddish-brown. Flowers are borne on green or pink, furry bunches, each bunch consisting of 12 fragrant cream-coloured flowers. The flowers live for only one night and then fall to the ground. Pollinated flowers develop into a fleshy, greenish ovoid fruit containing 1-4 shiny, oily brown seeds. The seeds are 3-5 cm long, elliptical and flattened on one side (Trees India, 2016; FOI, 2016; Fern, 2014; Orwa et al., 2009). 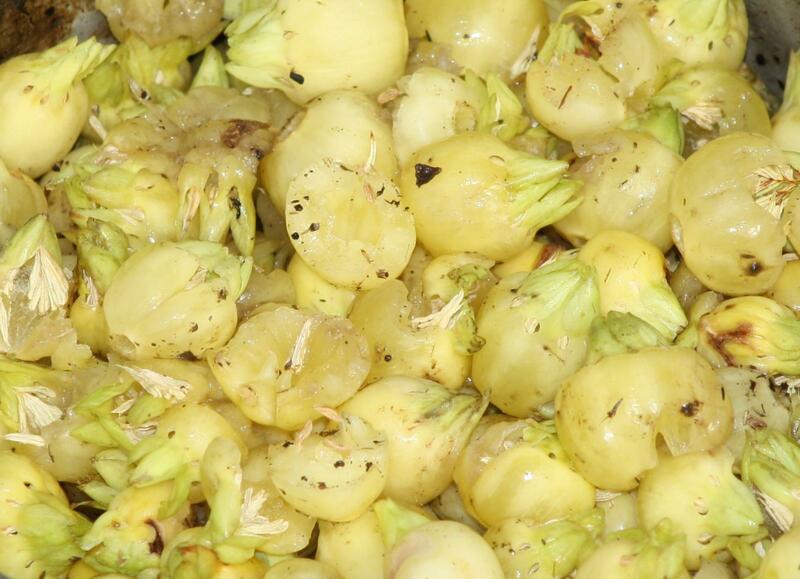 Mahua flowers, fruits and leaves are edible and used as vegetables in India and other Southern Asian countries. The sweet, fleshy flowers are eaten fresh or dried, powdered and cooked with flour, used as a sweetener or fermented to make alcohol (Fern, 2014). The fleshy outer coat of the fruit is used as a vegetable. In India, during periods of scarcity, a combination of mahua flowers and sal seeds (Shorea robusta) is boiled to prepare a substitute for grain staples (Sunita et al., 2013). Mahua is an oil plant whose seeds yield between 35 and 47% oil (CJP, 2007; Ratnabhargavi, 2013). Mahua oil is used to make soaps and candles and is also used as a seed preservative against pests (Orwa et al., 2009). Oil produced in smallholder farms is of low quality and is mainly used as a ghee substitute or adulterant (Fern, 2014). 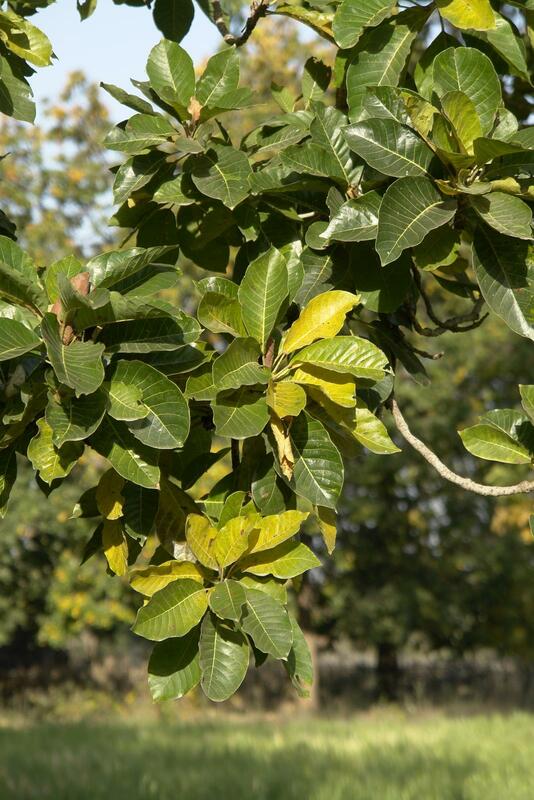 Mahua oil is reported to have potential use in biodiesel production. In India, potential mahua oil production could be up to 60 million t/year (CJP, 2007). The oil cake resulting from oil extraction is used as a fertilizer, and could be used to control root-knot nematode and fungal infections because the high saponin content reduces nematodes and phytopathogenic fungi (Gupta, 2013; Orwa et al., 2009). Mahua trees host Antheraea paphia, the tassar silkworm which produces silk traditionally used in making saris (Vantomme, 2002). Mahua is also used for its hard, strong, dense and reddish timber (Orwa et al., 2009). Mahua flowers produce a nectar that is very valuable to honey bees in periods of scarcity (Singh et al., 2008). Mahua is reported to have many applications in traditional medicine, and to provide several environmental benefits (see Environmental impact below). Several mahua products are used to feed livestock. Leaves, flowers and fruits are lopped to feed goats and sheep (Singh et al., 2008). The mahua oil cake (usually called mahua seed cake in India) is used for ruminants in areas where mahua oil production is important, but is generally considered detrimental to livestock performance due to its high saponin content (Singhal et al., 1986). Spent flowers, the by-product of alcohol production, are also occasionally fed to livestock (Reddy et al., 1966). Mahua is indigenous to India, Sri Lanka, Nepal and Myanmar (Fern, 2014). It is a frost resistant species that can grow in marginal areas of dry tropical and subtropical forests up to an altitude of 1200-1800 m. It can be found scattered in pastures, in crop fields in central India, and on rivers banks in semi-evergreen forests (Trees India, 2016; Orwa et al., 2009). It grows well where annual rainfall is between 500 mm to 1500 mm, and where temperatures are in the range of 2-46°C. Mahua does better on deep loamy or sandy-loam soils with good drainage, but it also occurs on shallow stony, clayey and calcareous soils (Orwa et al., 2009). Mahua seeds contain up to 50% oil. In the industrial extraction process, the seeds are first broken and flaked, the resulting flakes are then steam-cooked. The cooked flakes are crushed and solvent-extracted with hexane at 63°C. The resulting mahua oil meal contains less than 1% oil. In smallholder farms, the seeds are only crushed, resulting in an energy-rich mahua seed cake containing up to 17% oil (Ratnabhargavi, 2013; Singhal et al., 1986). Due to the low palatability and toxicity of mahua seed cake, there have been many attempts at improving its nutritional value. The most promising seems to be washing with water, which was tested with some success for ruminants and poultry (Singhal et al., 1986). Mahua trees are vegetatively propagated. Scions from the mother plant are grafted on year-old seedlings in July and are planted in September at 8 m spacing intervals. Mahua responds positively to N, P, K fertilizers. The trees start bearing fruits 10 years after planting and can yield fruits for up to 60 years. Old trees are more productive than young trees. Irrigation may be useful during fruit development but should be avoided during flowering and leaf shedding. In India, fruits are harvested in May, June and July. Seed yield ranges from 60 to 80 kg/tree/year. Mahua trees are also harvested for their flowers and yield 100 to 150 kg of flower DM/tree/year (Singh, 2016). Though not a legume, mahua develops mycorrhizal associations able to fix atmospheric N. Its extensive superficial root system binds the soil and limits erosion. 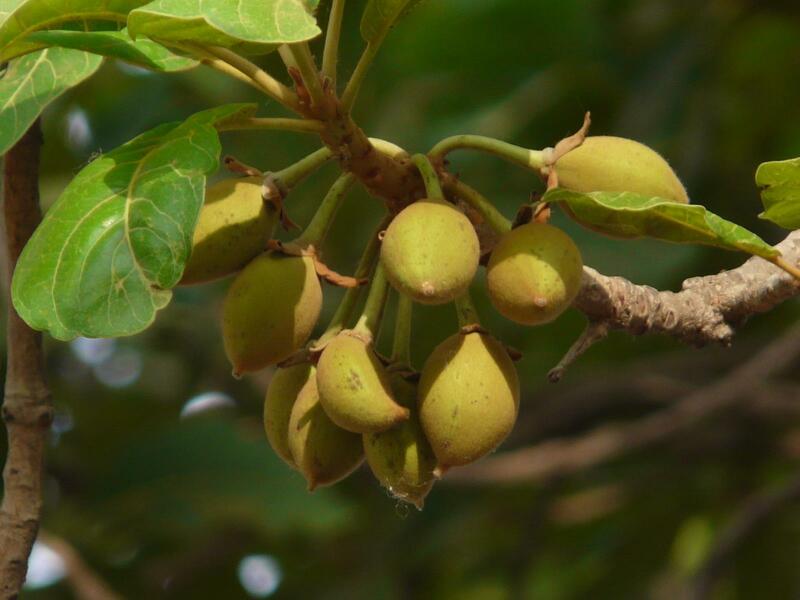 In India, mahua was used in soil reclamation on hard lateritic soils. Fallen leaves on the soil provide organic matter but they do not break down as easily compared to teak leaves or Shorea robusta leaves (Bargali et al., 2015; Manna et al., 2004). Mahua seed cake is used as a fertilizer and to control root-knot nematode (Orwa et al., 2009; Yadav et al., 2005). Mahua seed cake is relatively rich in protein (16-29% of DM), the solvent-extracted meals being the richest. Press cake contains about 5-17% oil while solvent-extracted meal contains usually less than 2% oil. The crude fibre content is generally low, from 3 to 12% of DM. The composition of mahua spent flowers shows considerable variation: samples collected from 3 areas in India contained 4-12% crude protein, 2-45% crude fibre, 2-8% ether extract and 4-11% ash (Reddy et al., 1966). 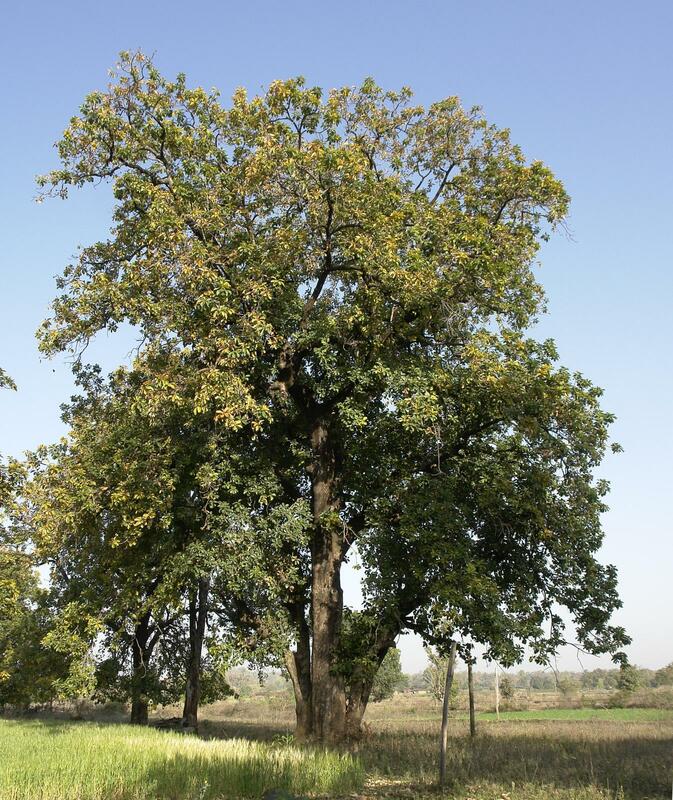 Mahua contains high levels of saponins, which reduce palatability and have antinutritional and toxic effects on animals, though less so in ruminants (EFSA, 2009). Mahua seed cake containing 5-6% saponins and fed to rats at 10-12% of the diet caused 100% rat mortality within a month (Mulky, 1976 cited by Shanmugasundaram et al., 1985). 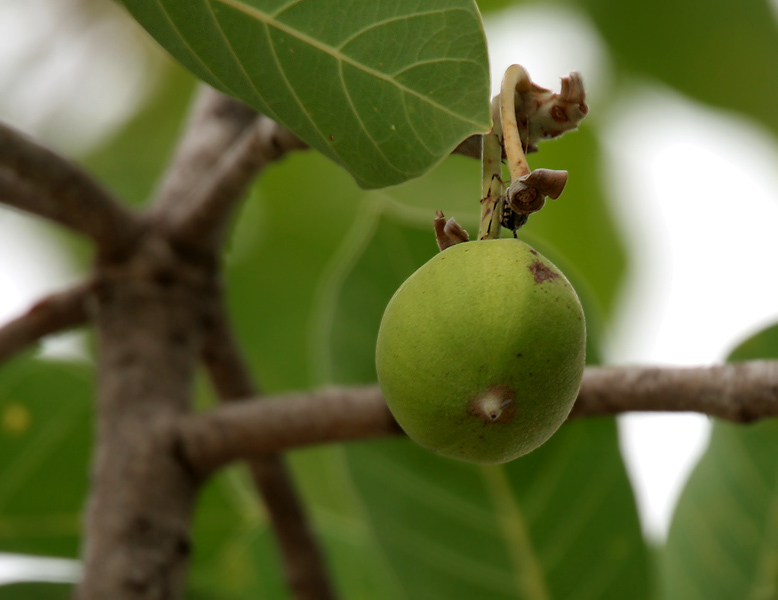 The oral LD50 in mice of crude Madhuca saponins was about 1.0 g/kg body weight. In mice and rats, Madhuca saponins caused local gastro-intestinal toxicity as well as liver and kidney toxicity. At lower doses, they are responsible for feed refusal leading to starvation, with reduced body weight gain and increased mortality (EFSA, 2009). There are few toxicity studies on monogastric animals. In chicks, it was reported that mahua seed cake included at approximately 12% of the diet was lethal (EFSA, 2009). Mahua seed cake contains tannins that affect negatively its utilisation in livestock feeding (Singhal et al., 1986). In India, mahua trees are abundant in some areas. Farmers collect the leaves, flowers and fruits to feed goats and sheep, and use mahua seed cake, flowers and spent flowers to feed cattle (Reddy et al., 1966; Singhal et al., 1986; Sunita et al., 2013). Mahua seed cake is generally considered as a poor feed ingredient for ruminants with a negative impact on protein digestibility and performance (Singhal et al., 1986). However, not all results are negative and in some trials ruminants tolerated water-washed mahua seed cake at inclusion rates up to 20% of the total diet (EFSA, 2009). The palatability of unprocessed mahua seed cake was found to be very poor but improved notably after a period of adaptation (Singhal et al., 1986). In lactating Murrah buffaloes, processed mahua seed cake was incorporated into the concentrate mixture to replace groundnut cake at 0, 25, 50, 75 and 100%. DM intake and nutrient digestibility did not differ between the 5 treatments. Milk fat, solids-corrected milk and solids-not-fat yields, percentage of fat, lactose, ash and total solids, and gross energy values of milk did not differ between the 5 groups (Tiwari et al., 1997). The use of mahua seed cake for feeding cattle and buffaloes was reported in tribal areas of Gujarat, India, in the late 1970s. There was no indication of lower feed consumption, adverse effects on productivity or symptoms of toxicity, which may signify that some adaptation occurred. Indeed, in a two-year experiment on growing calves, mahua seed cake did not affect growth. However, many trials have reported that animals fed mahua seed cakes performed less well than those on a control diet (Singhal et al., 1986). 12-14 month-old crossbreed calves fed a complete diet containing 20% of mahua seed cake had higher weight gain but lower crude protein digestibility than the control-fed animals (EFSA, 2009). In male buffaloes, solvent-extracted mahua seed cake, either alone or in combination with harad seed pulp (Terminalia chebula), was evaluated for its antimethanogenic activity. The intake digestibility of nutrients and energy utilization were not altered by the mahua seed cake (Inamdar et al., 2015). Mahua flowers are fleshy and sweet, and have been used by Indian villagers to feed their cattle (Reddy et al., 1966). Spent flowers (the by-product of fermentation) are also used as animal feed. They are palatable to cattle and no adverse effect on milk yield and milk composition has been observed (Singhal et al., 1986). Untreated mahua seed cake is toxic to chickens because of its high saponin content. In young chicks, high mortality was observed with high (35%) levels of mahua in the diet (Mukherjee et al., 1966). After removing saponins by water extraction, mahua seed cake still reduced feed consumption and growth performance of broilers, at only 5% of the diet (Dular et al., 2000). Unless an appropriate detoxification process is found, the use of mahua seed cake for poultry is not recommended. Spent flowers from alcohol production were used to feed broilers and maintained performance without adverse effects at up to 8% of the diet (Reddy et al., 1966). No studies have been conducted on rabbits (EFSA, 2009). No studies have been conducted on horses (EFSA, 2009). Mahua seed cake cannot be used for fish feeding. However, due to the stupefying effect of saponins on fish (Murthy et al., 2010), mahua seed cake is traditionally used in India as a stupefiant for catching fish in ponds, 0.5 kg of mahua seed cake boiled in water catching all fish in a 3 x 3 m pond (Kamalkishor et al., 2009).